Present location: set upright in the garden of Borthwick Mains, near Hawick. Evidence for discovery: local tradition traces the origin of the stone to Commonside where it stood in the River Teviot as a nilometer at a ford. 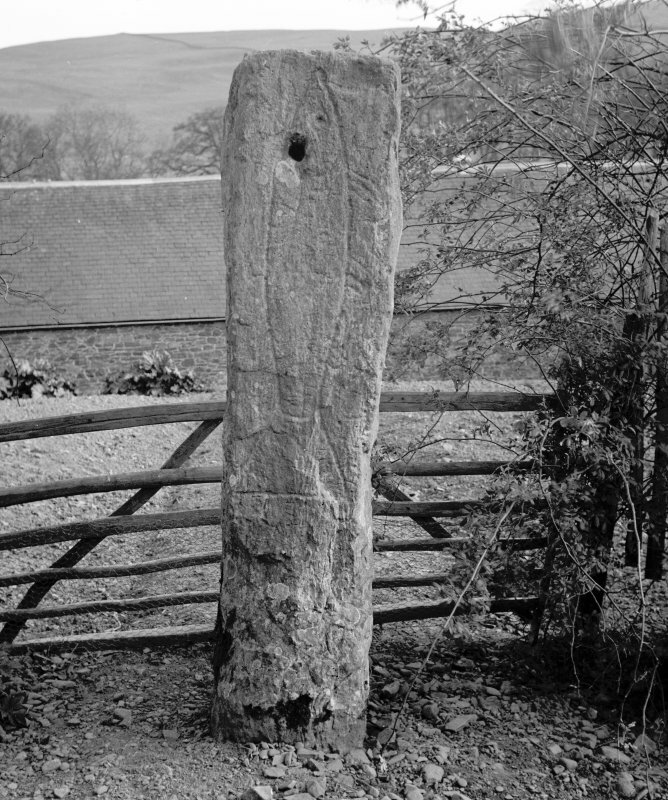 A secondary hole drilled towards the top of the stone suggests that it has also been used as a gatepost. Present condition: worn and damaged. Incised by pecking on one face of this squared pillar is a large fish set upright on its tail, 0.94m in length. Its left side seen in profile, clearly depicted details are an eye, the gills, all four fins and an arc separating the body from the splayed tail. No mouth is shown but otherwise this appears to be a salmon. Date: uncertain, medieval or later. References: Feachem 1950; RCAHMS 1956, no 855. 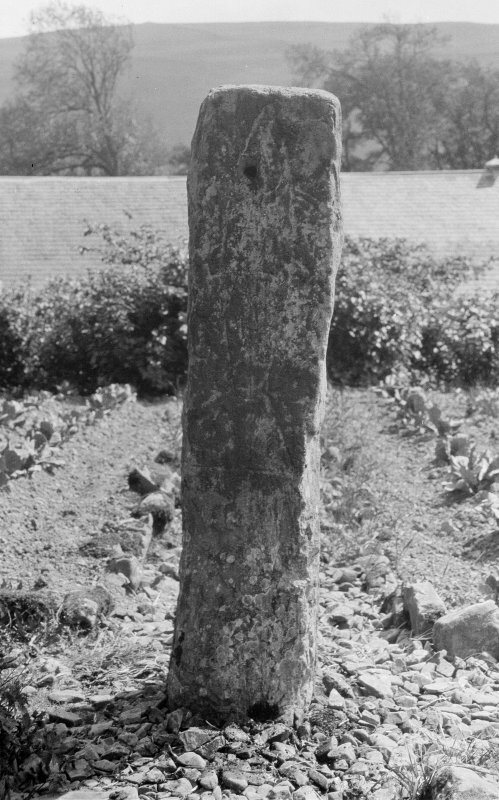 This Class I symbol stone datable approximately to the 6th or 7th century A D (E W MacKie 1975) stands on the lawn in front of the house at Borthwick Mains. It is 1.5m high and roughly square in section, each face measuring about 36cm across. The figure of a fish, 94cm long, with the tail downwards, is cut into the stone with pecked lines. A hole near the top of the pillar suggests that it was once used as a gate post. R W Feachem 1952; RCAHMS 1956, visited 1951. The symbol stone is as described and it is well preserved. The carving of a salmon is likely to be a marker denoting fishing rights on the River Teviot, erected by local Britons imitating the Picts. On the north face of this 1.5m high, roughly square-sectioned stone, is the incised outline of a fish, just under 1m long, aligned vertically-head; body and tail; fins, gills and an eye; and a line dividing body from tail. There is, however, no indication of a mouth. The outline has been made by percussion, by striking with some kind of a tool, a common technique. The fish was a familiar motif both in early Christian art and in the repertoire of Pictish symbols, and in this context it is likely to confirm the presence of Christian communities and to belong to the Yarrow Stone/Cat Stane tradition of early Christian stones. The stone was formerly part of a gate-post lower down the farm road (hence the hole near the top); it then became part of the garden wall. Oral tradition suggests, however, that it came from near Commonside beside the River Teviot (NT 4207); that it stood in the water, and that when the fish's tail could be seen it was safe to cross! It came to Borthwick, so the tradition goes, captured after a fight between the inhabitants of the two valleys. Information from 'Exploring Scotland's Heritage: Lothian and Borders', (1985). Visibility: Standing structure or monument.